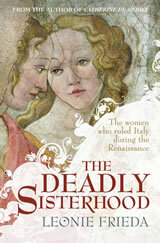 THE DEADLY SISTERHOOD is a story of drama on a grand scale, a Renaissance epic, as Christendom emerged from the shadows of the calamitous 14th century. Here are the stories of eight of its most remarkable women. Women who experienced great riches and power, but who also knew banishment, poverty and loss. As each heroine comes to the fore in her turn, she is handed the baton by her 'sister' and Leonie Frieda recounts the role each woman played in this hundred-year drama. Catherine de Medici has been published in the USA by Fourth Estate, and in Russian, Dutch, Spanish, Swedish and Czech translations.